This last week on Thursday, I attended the funeral of my great uncle Paul. 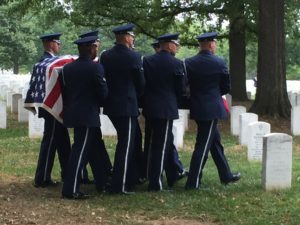 He was interned in Arlington National Cemetery with full honors. I knew before I ever arrived that I would cry. The service that is rendered to our solders, sailors, airmen, and marines always moves me. The beauty and simplicity of the service and the sharpness of those carrying the casket and rendering honors is so powerful! When my grandfather died in 2003 and we attended that funeral in PA; I was moved to tears during the 21 gun salute. After the service, I walked back to my car before my wife and kids. I needed a moment and there I sat and cried because I am so concerned for our future. I am so worried about what may come in this next election and I am worried that we will not have the moral courage and fortitude to stand for truth and righteousness. I fear that we will fail in our efforts to make America the powerful world leader it once was. That we will never be able to be the standard bearer for freedom and peace. “If you know the enemy and know yourself, you need not fear the result of a hundred battles. If you know yourself but not the enemy, for every victory gained you will also suffer a defeat. If you know neither the enemy nor yourself, you will succumb in every battle.” ― Sun Tzu, The Art of War. This is often said in simpler words, A warrior prepares for battle hoping he never has to fight. This is best symbolized in this clip from Hero, if you have not seen this film it is a beautiful story and will help to frame the context of this clip. I brought this up, because for several years (The Cold War), we were able to stand on principles (no matter what party the President was) and set the example and worked to provide real peace and friendship throughout the world. Now, we are mocked by many of our enemies and ridiculed by some that were once our friends. This saddens me because I know we are better than this, I know we have what it takes to stand tall and be the change we “wish to see in the world“. There are 2 prophets in the Book of Mormon what mourn for and pray for their people Nephi (the son of Lehi) and Enos. They both prayed for and wept for their people. While I am not a leader in the political sense and the only real group I have authority over is my family, in that moment of my life; I understood in a very personal and visceral way what they must have felt. I know that we as a people have the courage, faith, and love of each other to rise above the hostilities and bigotry that has been promulgated by the media, politicians, and groups in the public eye that are more interested in getting their way than understanding others. Louisiana and the citizens there stood tall and proud as they helped each other survive the floods … and we heard so little about it in the media … unless you got off the beaten path and find the local news for those cities or you follow a lesser known news website that covers things the MSM (Main Stream Media) likes to ignore. I have faith and hope that we can restore our virtue and honor as a nation and stand again as a beacon of hope for a lost and fallen world. We are the last great hope for humanity and if we let those who don’t believe it then we will fall down never to rise again.